Don McAfoose was born in 1947 in Indiana, Pennsylvania. He enlisted in the U.S. Air Force on June 15, 1966, and was trained as a Law Enforcement Specialist. His first assignment was with the 1360th Air Base Group at Orlando AFB, Florida, before volunteering for service in Vietnam in June 1967. McAfoose served with the 366th Security Police Squadron at DaNang AB in the Republic of Vietnam from June 1967 to June 1968. He then transferred to the 6213th Air Base Squadron at Taipei, Taiwan, where he worked for the Armed Services Police in the U.S. Navy Provost Marshal's Office from June 1968 to February 1974. During this time, he served as Traffic Administrator and was awarded the Navy and Marine Corps Medal for saving civilians from floods during a typhoon. He was also awarded the Taiwan Police Medal of Honor in February 1971. His next assignment was to the 91st Security Police Squadron at Minot AFB, North Dakota, where he served as a Security Police Investigator from February 1974 to May 1975, when he was transferred to the 18th Security Police Squadron at Kadena AB, Okinawa. He served as the NCOIC of the Security Police Investigation Unit there from May 1975 to 1978. During this time he was selected as the 5th Air Force, Pacific Air Force, and U.S. Air Force Security Police NCO of the Year. Sgt McAfoose was next assigned to the 6570th Security Police Squadron at Brooks AFB, Texas, and during this time he completed his Bachelor's Degree at St. Mary's University and was accepted for commissioning in the Air Force as a Transportation Officer in May 1979. 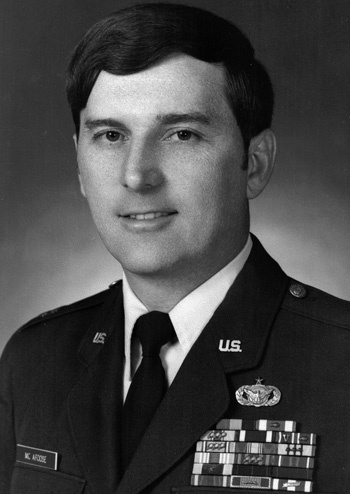 After graduating from Officer Training School in September 1979, Lt McAfoose was assigned as the Vehicle Maintenance Officer with the 12th Flying Training Wing at Randolph AFB, Texas, where he served until 1981. He then transferred to the 603rd Military Airlift Squadron at Kadena AB, Okinawa, where he served as Officer in Charge of Passenger Services from 1981 to September 1984. 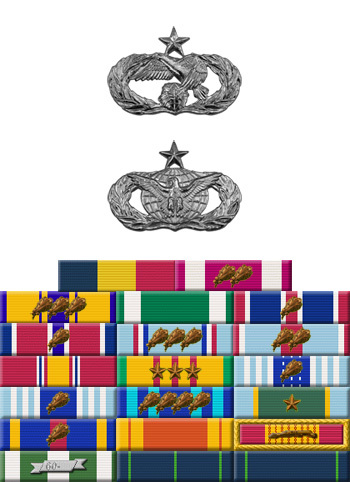 During this time he was selected as the 834th Airlift Division, 22nd Air Force, and Headquarters Military Airlift Command Transportation Officer of the Year for 1982. Capt McAfoose was then assigned to Headquarters Military Airlift Command at Scott AFB, Illinois, where he served as a Staff Officer in the Directorate of Passenger Operations from September 1984 until his retirement from the Air Force on November 1, 1989. For heroism on 30 September and 1 October 1968 while serving with the Provost Marshal's Office, Headquarters Support Activity, Taipei, Taiwan. Airman First Class McAfoose answered calls for assistance from numerous Chinese civilians and United States military dependents who were stranded in the vicinity of the Taipei American School due to the rapidly-rising flood waters generated by Typhoon Elanine. With complete disregard for his own safety, and fully aware of the dangers involved, he unhesitatingly plunged into the snake and rat-infested waters made even more dangerous by a swift-moving current of 15 to 20 knots, and effected the rescue of many endangered persons. By his courageous and prompt actions in the face of great personal risk, Airman First Class McAfoose was responsible for saving numerous lives, and upheld the highest traditions of the United States Armed Forces.